The twentieth century saw the advent of a number of universal figures who did not simply talk of peace but actually brought about changes in society that, prior to their arrival, had seemed to be impossible utopias. These great figures also stressed the same point: that it is impossible to achieve peace if we do not first find peace within ourselves. Shri Mataji Nirmala Devi is an unprecedented figure in the search of inner peace. She made this universal ideal into a concrete experience accessible to everyone through a simple meditation method called Sahaja Yoga. Since 1970 and until her death in 2011, Shri Mataji travelled internationally offering free public lectures and the experience of self-realization to all, regardless of race, religion or circumstance. The inner balance and peace that accompanies the practice of Sahaja Yoga Meditation has already benefited hundreds of thousands in more than 90 countries. In honor of Shri Mataji’s birthday, March 21st is celebrated as “Inner Peace Day”and is the occasion of sharing the experience and the benefits of Sahaja Yoga. 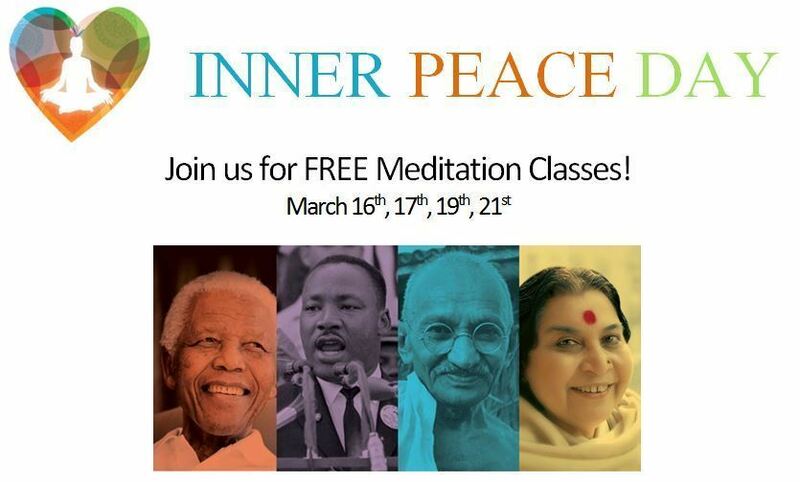 In Atlanta area, join us for FREE Meditation Classes!